Creative Hubs - Speaker Call Out! We’re looking for founders of UK based creative hubs to speak at an exciting event in Nigeria on 8th and 9th December. Do you fancy sharing your story with the creative community in Lagos? 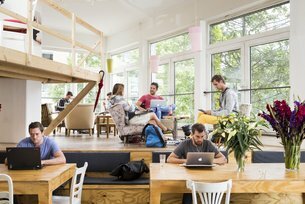 There is a growing worldwide trend towards people and businesses choosing to work in creative hubs - shared spaces that foster new, more collaborative ways of working. British Council Nigeria is supporting a creative industries Expo in December 2014, which will bring together some examples of Nigerian creative hubs and creative businesses. This Expo is part of the British Council’s remit to foster international collaborations and dialogue, sharing global learnings and examples of best practice. We’re inviting two creative hubs founders from the UK to take part in the Expo and showcase their successful model of a creative hub to the Expo audience. This will be a chance to showcase your business and your hub to an audience in one of the world’s most exciting emerging economies. - UK-based creative hub founders and managers who have set up and are running hubs or spaces to support creative entrepreneurs and creative communities. Our definition of a creative hub includes: hackspaces, incubators, accelerators, creative co-ops, labs, makerspaces, etc. We’re particularly interested in hearing from people who are interested in developing links with the creative start-up scene in Nigeria as we want the Expo to mark the beginning of some longer lasting conversations and connections between the UK and Nigeria. We would also be looking for the participants to follow up their trip by writing a short blog for our website on their experience of the Expo. The trip will be fully funded by the British Council and a modest honorarium will be provided for your time and input. How do you register your interest? - Hub/incubator profile: Please include a description of your creative hub or incubator (including size, sectors, building, ethos and business model). Please include contact details and website. - Personal statement: Please describe your own background, experience and interests in relation to founding and leading creative hubs/incubators. Submissions are accepted via email only. Please send completed statements to: lynsey.smith@britishcouncil.org. Submissions should be emailed before 5pm (BST) on 3 November 2014 and we will follow up with interested parties by Friday 7 November. We will select representatives who we feel can contribute best to the conversation in Nigeria. In an ever-changing global landscape, we recognise that hubs are integral to the sustainability and growth of the creative economy. Our Programme Manager and Global Lead of our hubs work, Lynsey Smith, explains. "Apples and Oranges": UK Creative Talent Unveiled!